The United States was the first major colony to revolt successfully against colonial rule. In this sense, it was the first "new nation." To see how, in the course of American history, its values took shape in institutions may help us to understand some of the problems faced by the new nations emerging today on the world scene. In The First New Nation, two broad themes occupy Seymour Martin Lipset's attention: the social conditions that make a stable democracy possible, and the extent to which the American experience was representative or exceptional. The volume is divided into three parts, each of which deals with the role of values in a nation's evolution, but each approaches this role from a different perspective. 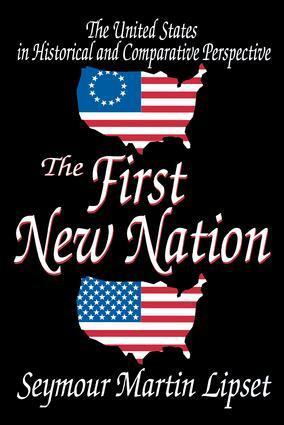 Part 1, "America as a New Nation," compares early America with today's emerging nations to discover problems common to them as new nations, and analyzes some of the consequences of a revolutionary birth for the creation of a national character and style. Part 2, "Stability in the Midst of Change," traces how values derived from America's revolutionary origins have continued to influence the form and substance of American institutions. Lipset concentrates on American history in later periods, selecting for discussion as critical cases religious institutions and trade unions. Part 3, "Democracy in Comparative Perspective," attempts to show by comparative analysis some ways through which a nation's values determine its political evolution. It compares political development in several modern industrialized democracies, including the United States, touching upon value patterns, value differences, party systems, and the bases of social cleavage.